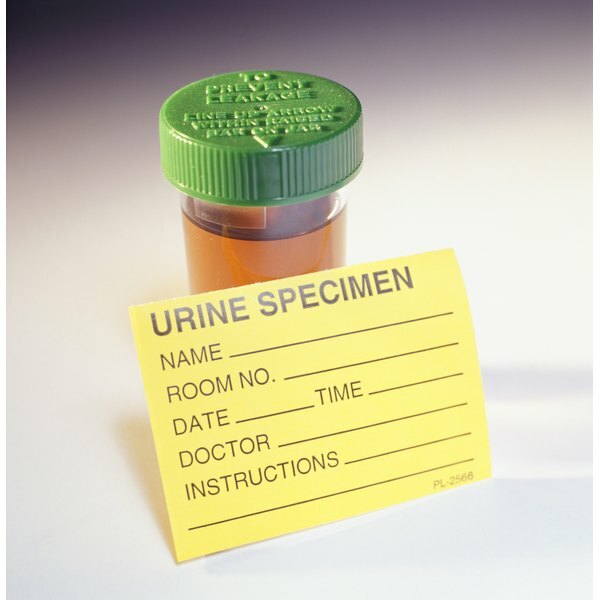 What Causes Orange Urine and Elevated Liver Function Tests? Urinary tract infections are detected at the clinical laboratory by through chemical analysis of the urine and microscopic confirmation. To counteract the infection, white blood cells migrate to the site of the infection. Detection of white blood cells in the urine is often indicative of a urinary tract infection. However, sometimes white blood cells are detected even when there is no infection. White blood cells are the main component of the body's immune system. They engulf and destroy invading organisms like viruses and bacteria. They also release antibodies to inactivate organisms and toxins. When cells in the body detect an infection, white blood cells move to the site of infection and begin to work. When the infection is in the kidneys, white blood cells will be found in the urine. Normal urine does not contain any white blood cells. A quick way to detect white blood cells in urine is to look for leukocyte esterase, an enzyme found in the white blood cells. When a urine sample is sent to the laboratory for analysis, the lab tech will dip a stick coated with different chemicals into the urine. Depending on the urine's chemical composition, the chemicals on the stick will change color. If leukocyte esterase is found, microscopic analysis is usually indicated to confirm the findings as false positive tests are possible. A microscopic urinalysis is indicated to confirm the findings of the chemical urinalysis. This is because certain foods and medications can have an effect on urine's chemistry to the point of causing false positive results. So the laboratory may report leukocytes in urine without the patient really having an infection. If the white blood cells really are in the urine, the lab tech will see them through the microscope. Pyuria is a term used to describe white blood cells in the urine. While most cases of pyuria are due to a true urinary tract infection, some cases are observed in patients without an infection. This happens when there is physical damage to the urinary tract, as is the case when kidney stones are passed. The white blood cells are a result of inflammation, not infection. There are also some conditions in which the number of white blood cells in blood is very high, artificially increasing the concentration of esterase in the blood and, subsequently, the urine. Only laboratory professionals can properly test urine for the presence of white blood cells and other abnormalities. Licensed health care providers are the only ones that can recommend and implement a course of treatment to correct the cause of pyuria or urinary tract infections. A constant feeling of having to urinate, painful or burning urination, urine of an abnormal color, and pelvic or abdominal pain are all reasons to schedule a visit to check for an infection or any other disorder. Rene Najera has been writing about health-related issues for over five years through different media. He holds a Master of Public Health degree from the George Washington University and conducts infectious disease surveillance at a state health department. He has also been a lab professional for over 14 years.